The U.S. conducted a campaign on Okinawa dubbed "steel typhoon" in March to June 1945 as Japan was stubborn in its final attempts to keep an invasive empire’s dream. Taiwan was Japan’s largest holding in the Pacific, as airports in Taiwan were used to launch air raids on Shanghai. But U.S. didn't engage in an invasion, and there were no boots on the ground in Taiwan. This is because the 1943 Cairo Conference already stipulated that after the war Taiwan would be returned to China (Republic of China), so the U.S. wanted to avoid major bloodshed in Taiwan, thanks to the Nationalist legal experts at Cairo. The man standing behind Roosevelt is Dr. Wang Ch'ung-hui (1881-1958), who was the legal architect representing the Republic of China. 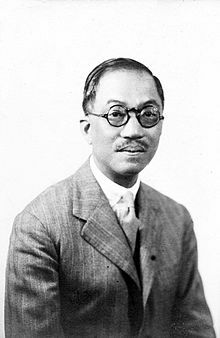 (from Wikipedia) Wang Ch'ung-hui (1881�C1958) was a prominent Chinese jurist, diplomat and politician who served the Republic of China from its foundation in 1912 until his death in 1958. He was a close associate of the republic's founding father, Sun Yat-sen, an active member of the Kuomintang ("Chinese Nationalist Party"), and a judge on the Permanent Court of International Justice in the Hague. In the Battle of Okinawa, Americans lost 20,195 lives and the Japanese 110,000. When the U.S. rooted out Japan, the local Okinawa people were under savage assault, not by Americans, but Japanese soldiers who would force mothers to kill babies hiding in foxholes, so the crying wouldn't alert their enemies the Americans. Taiwan was so blessed to be without an American invasion. On October 25, 1945, the allies accepted Japan’s surrender and Taiwan was returned back to China after 50 years colonization by Japan from 1895-1945. But 1946 promised to be a time when the Russians instigated communist terrorism in Manchuria after Japan's Manchukuo disintegrated. 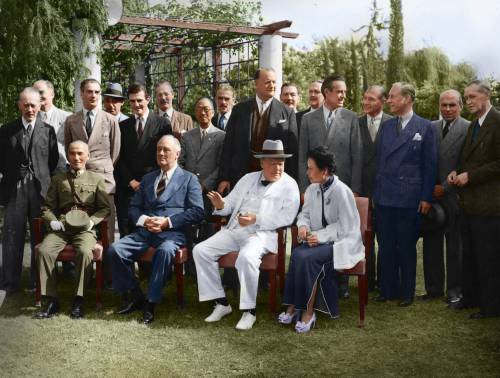 Unfortunately, based on the Yalta Secret Treaty, Stalin stipulated that the Russian military would accept the Japanese surrender in Manchuria, not ROC, and without the ROC attending. This violated her sovereign rights. Russia, without firing one shot, declared war against Japan three days after the atomic bombs were dropped. Russians sent troops to occupy Manchuria and dragged eight ROC government officials outside the Russian-owned train and shot them when Nationalists were trying to recover Fushun Coal Mine. Russians pillaged all of the heavy industrial equipment and power plants, and sent the equipment back to Russia. This caused the entire nation to protest against Russia and forced Russian troops to withdraw by schedule. In 1946, ROC exercised its only UN veto to go against Outer Mongolia Independence. I chanced upon a book while waiting to participate in a Hakka festival in Chinatown. It was written by a Beijing University scholar who worked for Marshall Luo Zhuo-yin (1896-1961) in the Burma war. He was involved in the extermination of Communists in Jiangxi Province. He was in the resistance war against Japan, Shanghai defense battle 1937, Nanjing, Wuhan converging war, and Northern Expedition. The writer is Chu Wen-juan (1895-1994), she was the ROC's first female colonel. She worked with Mao, Li Ta-zhao, Zhou En-lai during the period of cooperation between Nationalists and Communists. Colonel Chu mentioned that when her son Huang Jia worked in a Taiwan sugar plant as the 228 incidence occurred, she lost contact with him for 2 months. Later on she found out that her son was held at knife point, and the mob leader asked if this man was a good man. When others vouched that he was, he was released and allowed to live. This indicates it was a mob rule condition in Taiwan, where the locals were used to Japanese police control, but after the Japanese surrender there was a power vacuum, and was under guarded because the Chinese Nationalist troops were fighting the civil war against Communists on the mainland. There were many unemployed Taiwanese who formerly served in the Japanese police bureau, which controlled the local security with a tight grip. During the Taiwan mob rule era, former ROC President Yen Chia-gan, who worked as a government finance officer, had to be hidden by a Taiwan local family, Lin Xiantang, in Taichung. The ROC’s first Taiwan provincial chairman Chen Yi changed all the street names from Japanese to Chinese. He did this to reflect Chinese values like Zhongxiao road, Filial Loyalty road, Humanity Road, Peace Road. This alienated Japanese and their sympathizers.